Kristine “Krisy” Lynn Spiegelberg, 45, died Tuesday evening August 28, 2018 at her home surrounded by her loving family. She was born July 9, 1973 in Appleton, Wisconsin. Krisy is the daughter of Louis and Sherry (Miller) Weyers. She married John Spiegelberg on June 5, 1993 and celebrated 25 wonderful years of marriage this year. 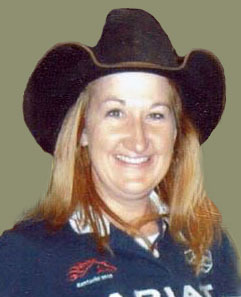 Krisy worked for Ariat International for over 10 years. She enjoyed her work and all her amazing co-workers. Krisy received many awards during her career and in June of 2018 received the “Rock Star” Award. Ariat’s support and compassion was a blessing for her and her family during her battle with cancer. In addition, Krisy, was the co-founder in 1993 and co-owner of Coyote’s Western Shop in Greenville, WI. She took pleasure in seeing the business flourish and grow. Kris, also, kept the shop well stocked with Ariat products. Riding horses was Krisy’s passion. She began riding at the age of 2 and she enjoyed competing at Little Britches Rodeos in her younger days. This led her to the WPRA Rodeo circuit and she was a WPRA gold card holder. Krisy was crowned Miss Rodeo Wisconsin for 1992. She competed at her final rodeo on June 29, 2018 at the Manawa Rodeo. Krisy was a women of strong faith in God throughout her life. She was a lifelong member of Immanuel Lutheran Church in Greenville, WI. She loved spending time with her family, cousins and friends and enjoyed every minutes she could with them. Krisy is survived by her loving husband of 25 years, John; their two marvelous children who were the pride of her life, son Colton and daughter, Colbi; mother Sherry Weyers; mother-in-law and father-in-law, Jack and Sharon Spiegelberg; brother Joshua (Penny) Weyers; two nephews, Beau Weyers and Tyler Spiegelberg; two nieces, Lucy Weyers and Kelsey Ham; and her brother-in-law, Chad (Sue) Spiegelberg; sister Cindy (Rich) Ham; Uncle David (Annette) Miller, Aunt Joann (Greg) Campbell and Aunt Janet Bartol; Godmothers Sharon Rickords and Marcia Smick; Uncle Larry (Bea) Weyers; Aunt Delores (Joe) Van Boxtel, Aunt Mary (Jerry) Glodowski; cousins Travis (Kady, Kyle and Brent (Jorden) Miller, Ashley (Ben) and Jack Stege, Brad (Molly), Libby and Lorelai Campbell, Ryan Campbell, Sam and Abby Bartol, Jill Kreklow, Tiffany and Olivia Holz, Jody Weyers, Louis (Renee) Zoie and Sophia Weyers and many additional cousins and friends. She was preceded in death by her father, Louis Weyers; and grandparents, Kenneth and Betty Miller, and Joe and Lucy Weyers. Funeral Services for Krisy will be at 11:00 AM on Wednesday, September 5, 2018 at IMMANUEL LUTHRAN CHURCH, W7265 School Road, Greenville, WI with Rev John Qualmann officiating. Visitation will be held on Tuesday evening at Valley Funeral Home, Appleton, WI beginning at 4:00 PM until 8:00 PM. Visitation will continue Wednesday morning at church from 10:00 AM to 10:45 AM, with the funeral service to follow at 11:00 AM. Burial will follow in the church cemetery. In lieu of flowers, memorials can be made for Colbi’s education. Krisy’s family would like to extend a special thank you to the entire staff at Heartland Hospice for all of their loving care and compassion.